Ukraine is ready to do away with supplies of Russian gas by increasing domestic oil and gas exploration and getting more from Europe, said Prime Minister Arseny Yatsenyuk. "We have proved that we are able to get rid of Russian gas dependence," Yatsenyuk said in an interview to the Ukrainian 1+1 channel on Sunday. He said that in 2013 Ukraine bought 95 percent of its gas from Russia. In 2014 that was reduced to just 33 percent, with the rest supplied from Europe. "We almost passed the winter. Few had hoped that we would pass it. I said it wouldn’t be warm, but we wouldn’t freeze,” he said. “After all, it was warm and we didn’t freeze," Yatsenyuk said. The prime minister called for increased domestic production of oil and gas and the implementation of reforms in the energy sector that will help Ukraine reduce its dependence on Russian gas. According to the state-run gas supply and transit company Ukrtransgaz, the country imported 5.1 billion cubic meters (bcm) of gas from Europe in 2014, which is 59 percent more than in 2013. The increase was due to the new Voyany-Uzhgorod pipeline opening in September 2014, which allowed Slovakia to supply 3.6 bcm, Poland 0.9 bcm, and Hungary 0.6 billion cubic meters. In 2014 Ukraine saved about $1.5 billion by buying cheaper European hydrocarbons. Imports from Russia decreased 80 percent in 2014 falling to 14.5 billion cubic meters. Deliveries of Russian gas to Ukraine in 2014 were suspended for almost six months. On June 16 Gazprom switched to a prepayment system with Naftogaz because of a $4.5 billion debt, and only resumed deliveries on December 9. This was preceded by lengthy negotiations with the European Commission, which resulted in Naftogaz repaying part of the debt for earlier gas supplies and beginning prepaying for new supplies. Yatsenyuk has admitted that Ukraine was on the brink of default if it had not been for the assistance from the IMF. In 2014 Ukraine received $9 billion in credit and paid off $14 billion in debts. Ukraine will receive $25 billion in aid in 2015. 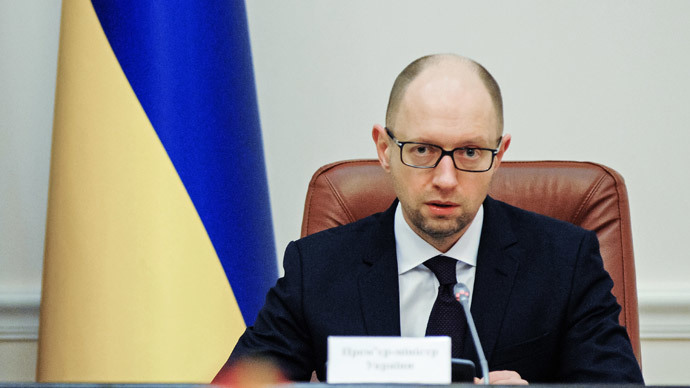 According to Yatsenyuk, some of these funds will be transferred to the gold reserves of the National Bank of Ukraine that will help stabilize the national currency’s exchange rate. The amount of gas stored in Ukraine has fallen by 4.5 percent since 2014 to 8.7 billion cubic meters which makes the facilities only 29 percent full. Experts predict there will be only 10 billion cubic meters in reserve by October 2015. The EU depends on Russia for a third of its gas which is delivered via Ukraine. However, the current deals expires in March and no substantive progress has been achieved to agree a new one, as Russia hasn’t had any assurance that Ukraine will be able to pay its bills and escape full-scale economic collapse. If both countries don’t agree to a new deal by October, Ukraine is likely to enter the winter with half of the reserves it normally does. EU Commissioner for Energy Gunther Oettinger has expressed concern Ukraine could start siphoning off Russian gas destined for the EU if it finds itself short of supplies.